The Burpee seed planting clock was offered for sale through the W. Atlee Burpee Company throughout the 1970s and 1980s. It's since been discontinued, but secondhand clocks are available. The clocks had a lovely vintage look to them, making them functional as well as useful. Today, they're sought-after by gardeners seeking a practical tool as well as garden lovers choosing garden-themed collectibles for their homes. Some gardeners struggle with the timing of when to plant seeds. 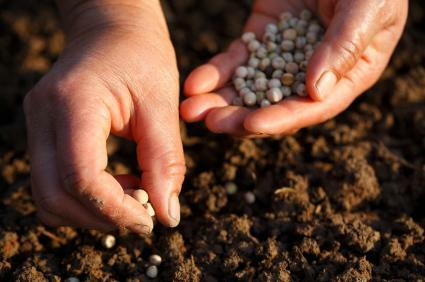 Many variables influence the timing of seed planting: gardening zone, cyclical weather patterns, type of seeds, even the phase of the moon for those who believe in moon phase gardening. The Burpee seed planting clock took all these into account and more to help gardeners determine when to plant seeds. Burpee no longer offers the clock, but you can often find them for sale on eBay and at garage sales, vintage shops, and other secondhand outlets. Look for clocks in good condition that are guaranteed to work. If you're trolling yard sales and flea markets for a vintage clock, bring along one fresh "C" battery to test the clock. A nonworking clock may just have a rundown battery. You will also need a small screwdriver and one "C" battery to run the clock. Some vintage clocks that have been kept in garages or potting sheds may be very dirty, and dirt and grime caught in the clock's inner workings can prevent it from running. It might be helpful to have a canister of Air Duster on hand, the type used to blast air to clean computers, or a little spray lubricant. One of the drawbacks of the seed planting clock is that it's cumbersome to set up. You'll need to remove the screws on the back of the clock to open it up and set the works properly. After the back is open, it's time to set all the parameters needed to calculate seed planting days. Once it's set, it is set for only this year's season. You will need to change the settings each year in late winter. Set the date on the clock using today's date. There's a little calendar wheel in the clock face that you turn to set the date and month. Be sure both date and month line up; in some older or well-worn clocks, the two may not line up perfectly, and the clock might not work. Next, rotate the little wheel in the clock face to the current moon phase. You might need a small screwdriver to insert it into the grooves on the wheel to make it turn. Be very gentle with the wheel. Don't force it if it doesn't want to turn. Use a little lubricant spray or a blast from an air cleaner, such as those used on computers, to dislodge any accumulated dirt or grime in a vintage seed planting clock. Set the moon phase date by turning the wheel until the correct phase appears. Set the frost dates by moving the little tabs on the back of the clock. There's one for the last frost date and one for the first frost date. This is important, as it sets the season length or the total number of potential growing days for your gardening zone. Replace the battery and the plate on the back of the clock, and you're ready to use your refurbished seed planting clock. The clock uses little pictures or icons to show gardeners when to sow seeds indoors, when to plant seeds outside, and when to set your seedlings in the garden. A little pot icon means it is time to sow seeds inside. A picture of a little plant appears when it is time to transplant your seedlings into the garden. A line appears when it is time to sow seeds outside. A vintage Burpee seed calendar clock is a unique find on the secondhand market. Although Burpee no longer sells brand new clocks, they were sold for almost two decades, and there are probably thousands still available. Used seed clocks sell for anywhere between $5 and $65, depending on the condition. A beat-up clock with a broken part may be available for $5 as a vintage collectible for display only. A perfectly functioning, brand-new or later model clock may be for sale for as high as $65.